Interconnectedness and connection have been on my mind recently. So has "place". As in where you are as well as your role within your space. Yet more food for thought on a fantastic evening on the Patch. I finish work and head down to Inner Marsh Farm. This evening the light is perfect for this site. We arrive at the hide and it is empty. Bonus. Settle in and start to observe and record. 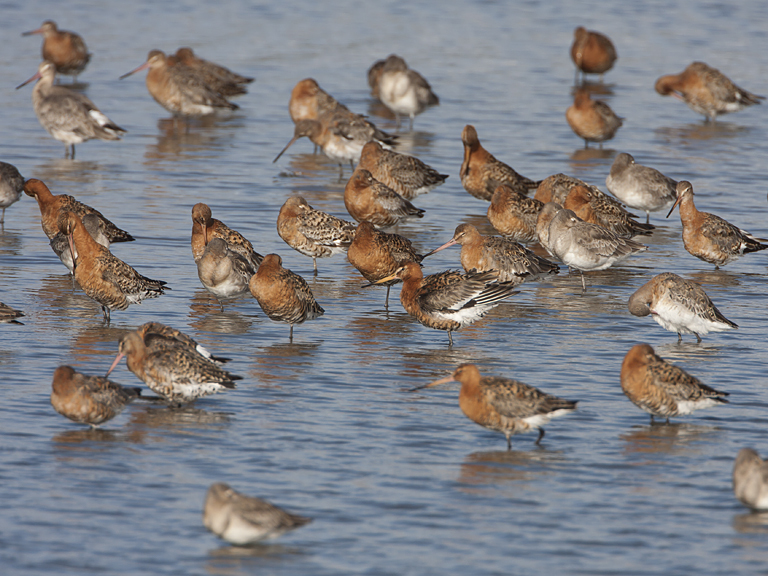 Blackwits here in good numbers. 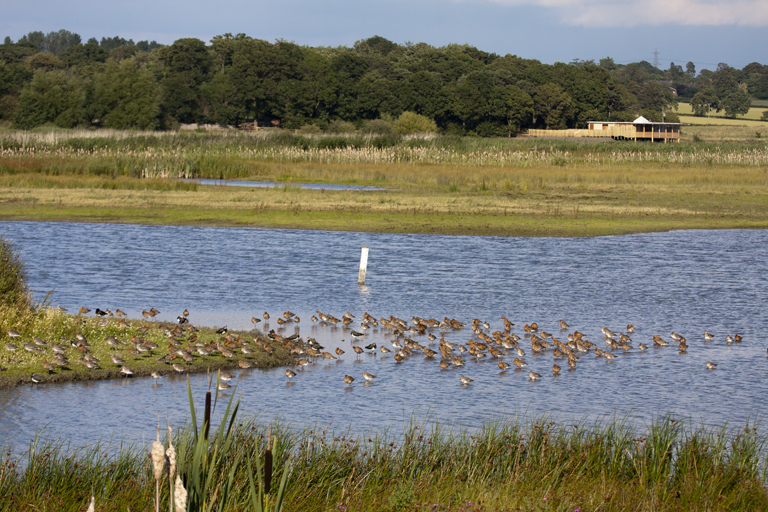 Around 200 in the flock infront of the hide. They look stunning in the evening sun. Many are in summer plumage. Orange is insufficient to describe their colours. Beyond terracotta they have gone metallic. Copper tones reflect the ripples of the water. Beautiful. Now we all know I am right into looking for colour ringed Black-tailed Godwits, so I have to get out the 'scope and have a look. 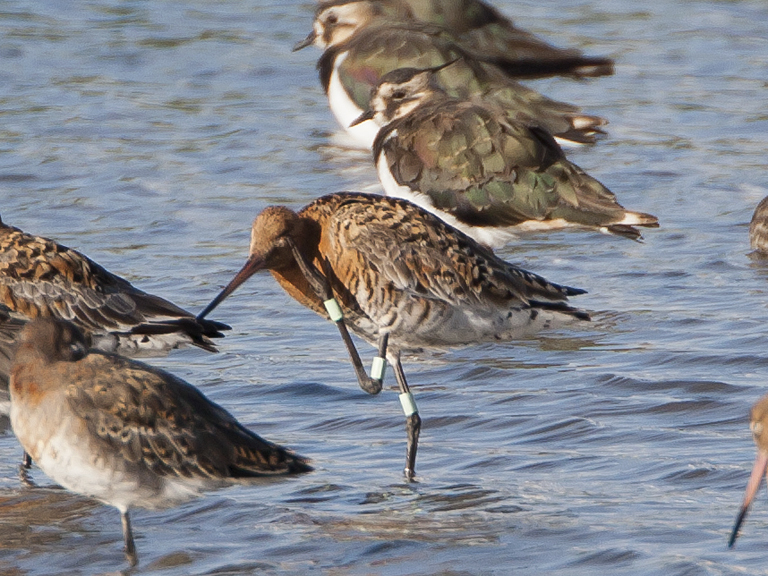 About 1% of the Icelandic population of Blackwits are ringed so, if you believe in statistics, there should be 2, at least 1, in the flock loafing before me. Many are stood belly-deep in the water so they could be full of rings and I'd never know. Ho-hum. I just admire them in their glorious summer garb. On a lazy evening like this one the peace is only interrupted by the piping of a grumpy Oystercather. 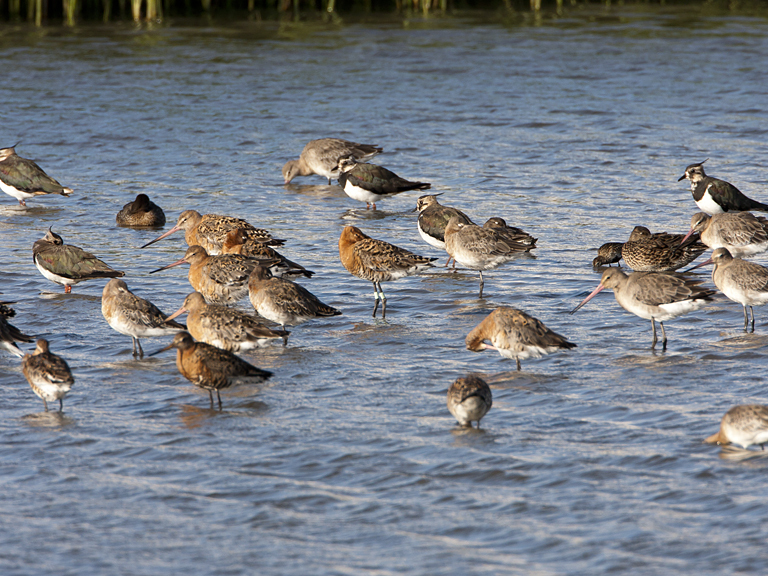 It seems to have issues with several of the Blackwits, running about the island pecking at the odd one. I use this to my ring-searching advantage. 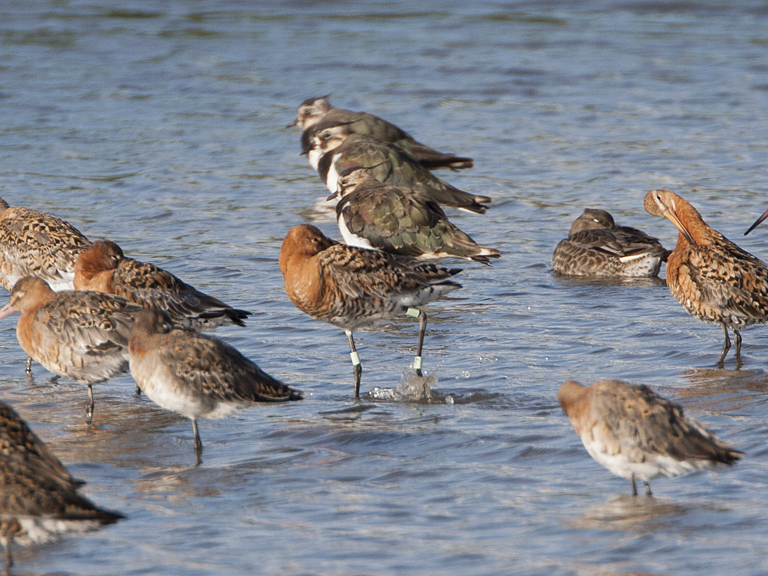 As Oyc pecks the Godwits get up and run off showing both legs. 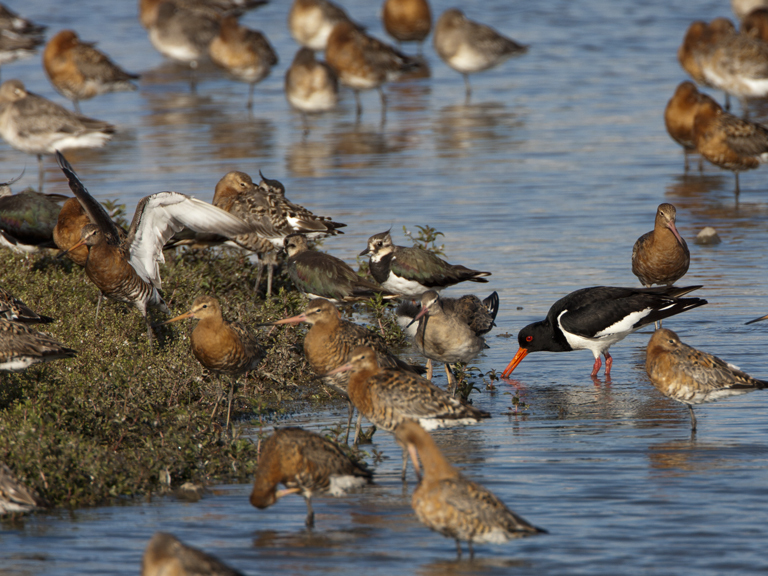 I follow the P-O'ed Oystercatcher on it trail of grumpiness but I don't find any rings amongst the fleeing Blackwits. It's not exactly been a wild day but I am finding IMF very relaxing. The birds seem contented too, many washing and preening, some sleeping. Nobody seems to have a care in the world. Of course this cannot last. An unseen raptor makes a pass overhead and the flock is up as one. Just the flightless Oyc chick and it's now furious parent remain on the muddy island opposite. 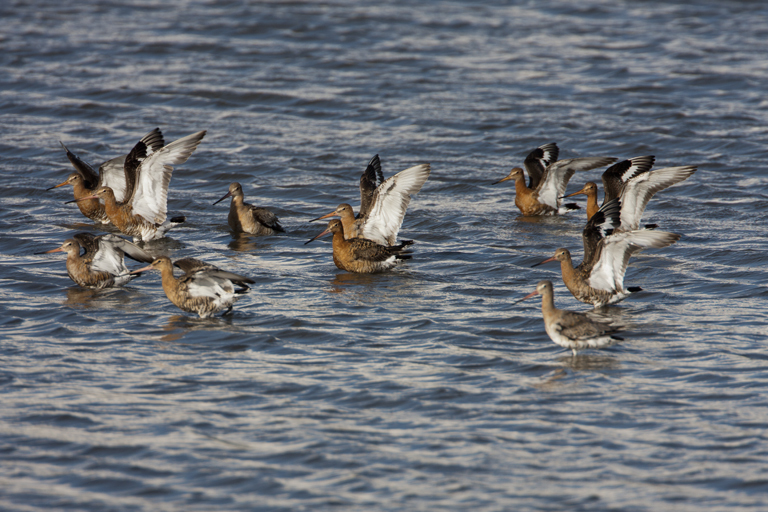 Blackwits shrill in thier alarm are swooping around. Now I'm not usually a fan of disturbing birds as I have mentioned in earlier posts, but this will move then about and might just reveal a ringed bird that was previously out of sight. 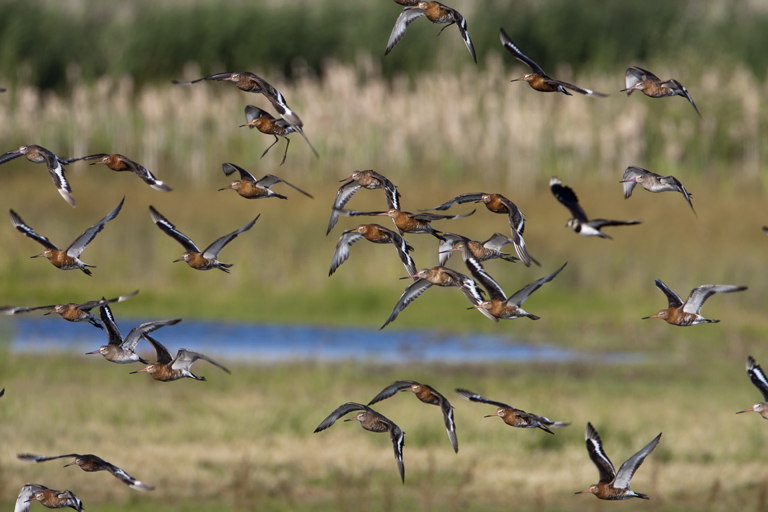 I fire the shutter on the camera as the flock spins around the Reserve waiting for them to settle. Then I'll have just a few seconds before they resume one-legged poses and heads are tucked under wings. Most in the deep open water. Oh well. I guess it just aint my day for a ring sighting. But then I notice in the furthest group a flash of something on a tibia. Yes, a ring! Extreme telephoto lens is brought to focus on the individual. Two light green rings. Usually there are 4 rings of differing colour on the 2 tibia, so this is a little unusual. I only know of one bird with rings like this one. It has another light green ring on it's left tarsus. In Blackwit code it is L//L-L. I have seen this one many times before. However, I need to see the 3rd ring to be sure. So I keep the camera trained on it and wait. Sure enough my patience is rewarded and it flicks it's leg out. It is L//L-L. It was a Thurstaston Shore regular during the winter of 09/10, a quick look in my notebook tells me I last saw this bird on 24th February 2010. A no-show during the winter just gone I had feared that it had perished, but no, here it is in rude health. It is odd to see it in summer plumage. I have only ever seen it in it's grey beige winter coat stalking the flats off Tinker's Dell. I am elated, I take dozens of pictures of the bird. More than I'll ever need or use, but I can't stop. This starts me thinking. How many other birds in this flock have I seen before? It must be several, statistics and probability would dictate that I have crossed paths with a few. My feelings of connection with the Patch grow a little more. Where has it been in the 17 months since we last met? Did it breed? How many chicks did it raise? Is it here now because it failed this year? So many questions. The answers lie right here in my place, and also in Iceland and many points in between. My lines of connection and feelings of interconnectedness are spreading beyond the Patch. As I get metaphysical and a little misty-eyed I look again to old friend L//L-L and wonder what thoughts it's had, adventures it's had, where it will go from here and if our paths will cross again. L//L-L has a scratch, does a pooh and goes to sleep.